“The so-called work in progress,” Martin Amis wrote in the year following the 9/11 attacks, “had been reduced overnight, to a bubble streak of pitiable babble. But then, too, a feeling of gangrenous futility had infected the whole corpus.” For Amis, as for other writers, the destruction of the World Trade Center by terrorists from the Middle East was a coming to terms with the changing dynamics of Western power, a sudden realisation that the large-scale violence that had until then been exported to former colonies and client states had come home. “I felt that we had gone through great changes and now was the time to just go back to school, as it were, and start to learn,” Ian McEwan said in an interview. “… [T]here are disturbances now, in large and small ways … For many people, the event has changed the grain of the most routine moment,” Don Dellilo wrote in December 2001. Mainstream literary criticism, however, did not take note of another novel that addressed the changes that had come to pass in the United States after the attacks—as is often the case with representations of genre fiction in literary criticism. 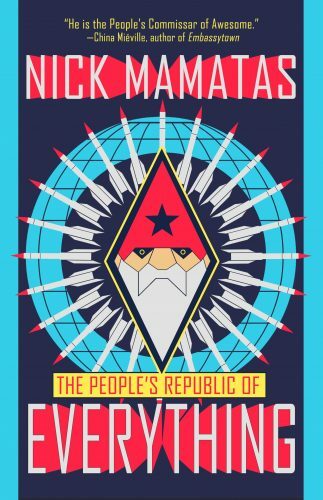 That novel is Nick Mamatas’s Under My Roof, first published in 2007 and now collected in The People’s Republic of Everything. Gray’s essay on the 9/11 novel (published in 2009), so perceptive on the domestication of trauma, in a way did not consider the full range of literary responses to the changes that the attacks had brought with them. So Daniel Weinberg builds a nuclear bomb from discarded smoke detectors and commercial-grade uranium packed into a garden gnome, declares Weinbergia’s independence, and secedes from America. All of this—Daniel and Herbert building a bomb, the plans they work through, and the declaration—is laced with a sardonic humour that brings to the fore the absurdity of all that has come to pass in the United States since 9/11. Daniel sneaks onto Geri’s laptop to write a peace treaty, before which he informs her that he is sending “peace treaties to all the members of the Brotherhood of Evil Nations,” and tells her that “in this topsy-turvy world, I really feel that we need a one-megaton nuclear bomb. It’s not even half a Hiroshima” (p. 235). Tommy’s response to Daniel on the need for national security rings true for Cold Warriors pushing for aggressiveness in the Eastern Bloc as much as it does for neoconservatives calling for American intervention in Iraq and Afghanistan; the politics of Under My Roof draw not just upon the events of the six years preceding its first publication, but a long, drawn-out process that has through half a century led to the consolidation of American power. While Under My Roof does step beyond addressing merely personal crises during a critical juncture in American politics, large sections of the novel, and the ones that have a major bearing on its outcomes, are still confined to the domestic—Geri’s feelings of helplessness since the day of the attacks, the disharmony in the Weinberg household, and Geri’s departure—and often determine public perception of Daniel and Weinbergia. While Mamatas examines the disarray in American politics with a keen eye, he still falls short of addressing how this plays out in the case of non-white Americans and immigrants, save for a few instances which are again well executed with dry wit. Take, for instance, Herbert’s school assignment, “Five Reasons Your Immigrant likes America”—which he fills out himself—where the responses include: “I’d better like it,” And, “Life’s a bit easier under America’s domestic policy than it is under its foreign policy, let me tell you” (p. 283). But Under My Roof is, in the end, chiefly concerned with American anxieties in a world that has been shaped by American capital, culture, and military power. The novel often meanders away from what are its strongest points to descriptions of quasi-religious experiences and awkwardly placed jokes, as in the case of a Long Islander who is not fond of watching the poor walking in the streets, and the outcome of the novel could have been drawn with fewer words than are used. But one thing that the reader will notice about the novel and short stories collected in The People’s Republic of Everything is that they form a good, enjoyable collection, where Mamatas has drawn upon a wide range of personal and political concerns—the life of the writer, ruminations on parenthood, the fate of left-wing politics—to write stories that are funny, deeply evocative and bewildering. One of these stories, “The Glottal Shop,” begins: “Dating cis was rough, no doubt. For any woman, but especially for Beatriz Almonte, a living meme who had several years ago made a mistake and gained the attention of a secret bulletin boards full of trolls for whom harassing her was a vocation not dissimilar from the priesthood” (p. 133). In a little over twelve pages, the story recounts the terrible experiences of internet dating, through which the protagonist ends up meeting men—whose nauseating politics are reminiscent of Gamergate, 4chan boards and the alt-right—and needs to be prepared, on dates, “with everything from weapons to condoms.” The only story original to this collection, and also the most recently written, “The Glottal Shop” acts partly as a distressing primer on the online culture wars, in which trolls, racists, and misogynists found their share of power greatly increase. “The Great Armored Train,” on the other hand, is a turbo-charged account of a military expedition during the Russian Civil war, during which Trotsky’s train, rampaging through war-time Russia, leaving defeated Cossacks and Mensheviks in its wake, is infiltrated by a vengeful Tatar woman. In no time, using legend and folklore, Trotsky’s materialist philosophy is turned upside down and the horrors of the Russian Civil War are brought to light. There is a sense of part-wonder and part-admiration brought forth through the Bolshevik soldier Gribov—"So, this is what communism means? The train was magnificient"(p. 81)—and Mamatas writes of this in the accompanying story notes, describing the brief time he spent as part of a neo-Trotskyist organization. But the fascination is soon upended, and his opposition to war is borne out through the indignation of the Tartar infiltrator. Some theory finds its way into the story and fits seamlessly into the narrative, in those parts where Engels speaks of his concerns over steam workers replacing the proletariat, elimination of the need of labour from workers, and the threat of further concentration of power with the bourgeoisie; these concerns are similar to those over job losses that are likely to occur if capital and private profits are not eliminated before automation and artificial intelligence replaces human labour. Much of this stems from Tony’s wish not to be the last member of the “Kalafatis family, its thousand-year march of industrious goatherds and restaurateurs and hunch-backed widows, to have a filakto” (p. 103), and anxieties over raising a child in a tumultuous world: “Maybe the baby could go back one day, meet the cousins, even settle down, once America finished tearing itself apart” (p. 103). There is unevenness in The People’s Republic of Everything, and some of its other stories feel like mere fillers. While in the collection’s best stories pulp, politics, and humanity are combined with narrative to create deeply reflective work, stories like "The Lab Rat" and "Slice of Life", while fun to read, struggle to find a greater purpose. But the few shortcomings of the collection are easily overcome by its stronger elements. Mamatas’s fiction has clearly been shaped by years of political activism and time spent in the indigent parts of American cities—and a sense of familiarity with the subject, often absent in the sort of overtly political American fiction so excoriated by Gray, shines through. Read it and you will not forget what is brought out most clearly in his work: a sense of despair and righteous anger at the present, balanced with some hope of a better future.